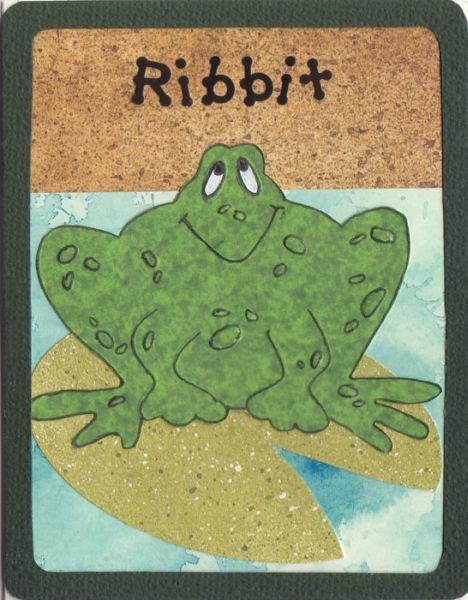 I purchased the frog template for this card at a little scrapbooking store while on vacation in Angel's Camp, California. Angel's Camp is home of the "Celebrated Jumping Frog of Calaveras County," which was written by Mark Twain. If you ever visit Angel's Camp or the surrounding towns, you will find lots of interesting frog statues, so naturally, I wanted to bring something "froggy" back home with me. After embossing the frog for this card, I used a white gel pen to color in his eyes. I also used a black pen to add detail to his warts, mouth and legs. I think he's kind of cute. Card blank 4.25" x 5.5"